Molecular bioloist Dr. Judy A. Mikovits was thrown in jail after discovering evidence that deadly retroviruses are transmitted through vaccines given to humans. Dr. Mikovits worked with human retroviruses and focused on immunotherapy research and HIV. In 2009, she was doing research on neurological diseases, including autism, when she discovered many of her study subjects were suffering from serious medical issues. These issues included cancer, motor-neuron disorders and chronic fatigue Syndrome (CFS). Collective-evolution.com reports: She believed a virus may have been responsible for these symptoms, and through her research, she isolated the viruses that turned out to come from mice. It looked like a virus, it smelled like a virus, a retrovirus, because those are the types of viruses that disrupt the immune system. And several other investigators back in the 90s had actually isolated retroviruses from these people but the government called them ‘contaminants,’ that they weren’t real and that they didn’t have anything to do with the disease. Well, we isolated a new family of viruses that were called xenotropic murine leukemia virus-related virus. So these viruses were murine leukemia viruses, mouse viruses. So spin forward two years, our paper published in one of the best scientific journals in the world in Science, October 8th, 2009. Usually that makes one’s career, in my case it ended my life as a scientist as I knew it. So in 2011, another AIDS researcher in a journal called Frontiers in Microbiology wrote a paper that really cost me a lot; I didn’t know that he was going to write this paper, but it basically said the most likely way that these murine leukemia virus-related viruses, these types of viruses, entered humans, was through vaccines. So when did we start vaccines? 1953, 1934, right in the 30s with the polio, and what we were doing to attenuate, to make the virus less pathogenic, less toxic, is we were passing them through mouse brains, so we were passing them through the brains of mice, and every scientist who works with these viruses, and worked at the National Cancer Institute recognized the possibility that if you put human tissue and mouse tissue together the possibility is that you’re going to pick up a virus that is silent, in the mouse, that is it doesn’t hurt the mouse, but it kills the human, or causes serious disease in the human. I was fired, jailed, without cause, without hearing, without any civil rights at all, just drug out of my house in shackles one day, on November 18th, 2011, I refused to denounce the data, I refused to say it was a mistake, we have the data, I showed the data, I showed all of the data, and I just refused, they basically said tell everybody you made it all up, and you can go home. And if you don’t, we’ll destroy you. And they did. She was arrested without a warrant and held in jail for 5 days without the opportunity for bail as a fugitive from justice, and was given a 4-year gag order. Her career was destroyed. Her story is documented in the book Plague: One Scientist’s intrepid Search For the Truth about Human Retroviruses and Chronic Fatigue Syndrome, Autism, and Other Diseases. Ironically, the FDA has now approved a testing protocol to detect retroviruses in the U.S. blood supply which is worth millions of dollars, and based in large part on Dr. Mikovits’ research, but it is being managed by Big Pharma. 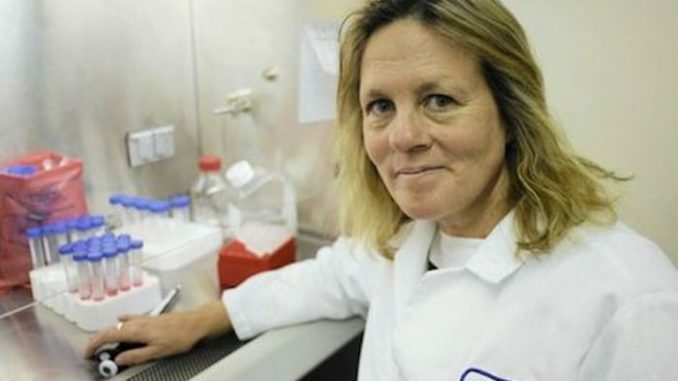 So while this distinguished scientist is now bankrupt and without employment, others are allegedly capitalizing on her research to earn millions of dollars to clean up the U.S. blood supply.